WASHINGTON—The U.S. aluminum industry was on the brink of extinction a year ago, but it is thriving now due to the aluminum tariffs imposed by the Trump administration. 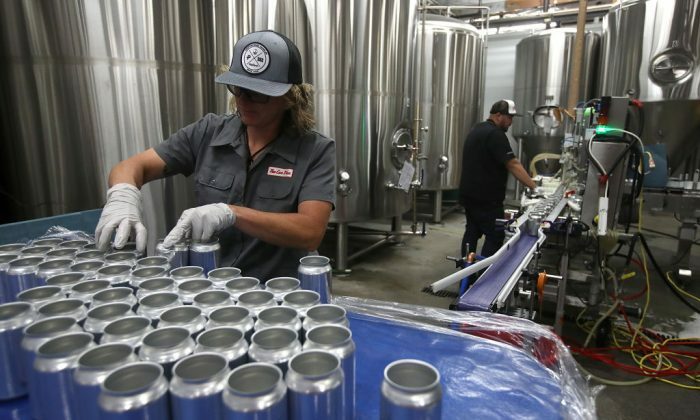 A new report by the Economic Policy Institute (EPI) shows that the 10 percent levy on aluminum imports imposed in March is bringing back thousands of American jobs, sparking reinvestment in aluminum manufacturing, and contributing billions of dollars to the U.S. economy. China accounted for more than 80 percent of the total increase in global aluminum production capacity between 2000 and 2017. Chinese primary aluminum production capacity increased by nearly 1,500 percent during that period, according to the EPI report. The Chinese government has suppressed global aluminum prices by subsidizing its manufacturers and letting them produce far more steel and aluminum than the global demand. And much of the excess capacity ended up in the United States, where it was sold at rock-bottom prices. Collapsing prices created a destructive ripple effect on domestic producers and workers. The aluminum price fell 39 percent between 2007 and 2016. As a result, 18 of 23 domestic aluminum smelters shut down, causing 13,000 people to lose their jobs between 2010 and 2017. In 2016, there were three alumina refineries supplying U.S. smelters; by 2017, only one was in operation. President Donald Trump signed an order March 8 that imposed a 25 percent tariff on imported steel and a 10 percent levy on imported aluminum. Following the announcement, the domestic manufacturers of both primary aluminum and downstream aluminum products started to reinvest in domestic production, creating thousands of jobs. According to EPI, American primary aluminum production is projected to increase by 67 percent (500,000 tons per year) between 2017 and the end of 2018. And a total of seven smelters will be in operation by the end of this year. In the downstream aluminum industry, 22 new and expansion projects have been announced, adding about one million tons of annual rolling and extrusion capacity to the domestic industry. To date, the aluminum industry has added only 300 jobs since the date the tariffs were imposed. However, the planned restarts and capacity expansions, once finalized, will create more than 3,000 jobs, the report said. Aluminum manufacturing is highly capital-intensive and restarting closed production facilities is a costly and time-consuming process, the report explained. Nearly $3.4 billion will be invested in these new and expanded facilities. In 2017, the Commerce Department launched a Section 232 investigation to determine whether steel and aluminum imports were a threat to national security. In February, the department concluded that both steel and aluminum imports formed a threat and recommended immediate action. As a result, Trump signed the orders applying tariffs worldwide, drawing criticism for his move. “Many economists and business people and economic commentators in the press all claimed there would be horrific effects of the tariffs on the domestic economy,” Scott told NTD TV. However, there is no evidence to suggest that the imposition of tariffs has had a “negative impact at all on the economy or on downstream industries,” he said. The U.S. manufacturing sector added nearly 176,000 jobs, including 2,700 in metal production since February this year. And in the rest of the domestic economy, 1.4 million jobs have been created during the same period. Former Sen. Evan Bayh (D-Ind. ), who supports aluminum tariffs, claims there are important national security considerations. Speaking at an event hosted by the American Primary Aluminum Association, Bayh said no nation should place its ability to defend itself into the hands of others. “That’s why it is important that we retain at a minimum the capacity to produce steel and aluminum products necessary for our military,” he said. At the event, Scott Paul, president of Alliance for American Manufacturing, said it would be a mistake if Congress tries to roll back these tariffs. “It’s essential that we restart the process of arriving at a solution for [the global] overcapacity but the tariffs have to stay in place until that’s been stabilized,” he said. It is also important that U.S. steel and aluminum manufacturers increase their production to a sustainable level consistently before reducing these tariffs to zero, he added.